On Sale Now! Free Shipping Included! Save 8% on the Doral Headboard with Dark Walnut Wood Posts and Metal Grill, Matte Black Finish, Full by Fashion Bed Group at Forskolin Slim. SKU: FBG-B92274. MPN: FBG-125. Hurry! Limited time offer. Offer valid only while supplies last. The Doral features a classic and transitional style with a calming simplicity that will sustain a timeless elegance in any master suite or guestroom. The Doral features a classic and transitional style with a calming simplicity that will sustain a timeless elegance in any master suite or guestroom. Constructed of carbon steel and for stability and years of everyday use, the charming curved top and timeless grill design highlight the 51-inch headboard grill. The metal grill is finished in a textured Matte Black powder coat to provide a perfect neutral base on which to build your bedroom design. Sturdy solid-wood bedposts are finished in a Walnut, medium tone wood color to blend with many decors. A good ornamental (or fashionable) headboard will fuse with the surrounding décor, accent your other bedroom furniture and transform a room from ordinary into something interesting and sophisticated. The Doral is designed to provide long life with carefree maintenance, while creating a calming retreat area that you’ll look forward to utilizing during all hours of the day. This unit measures 51-inches (H) x 55.5-inches (W) x 3.5-inches (L) and includes a headboard, (2) posts, instruction sheet, and hardware bag with everything needed for some easy assembly. 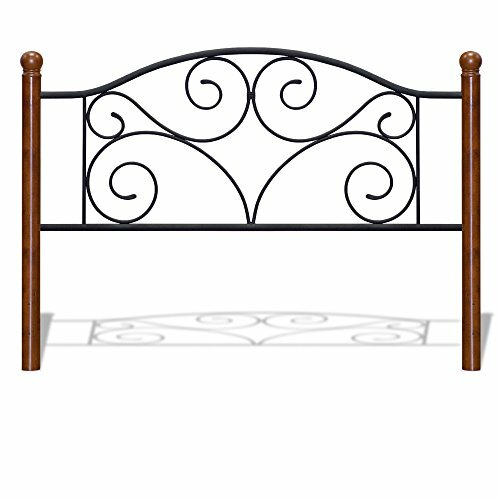 The Fashion Bed Group Doral Headboard comes with a 10-year limited warranty against defects in workmanship or material. The Fashion Bed Group, a division of globally diversified Leggett & Platt Inc., is an industry leader in the production of fashionable beds, adjustable bed bases, top of bed textiles, bedding support and barstools. By keeping a close eye on the design community and other fashion and decorating sources, Fashion Bed Group stays on top of the trends and knows the right mix of finishes and innovative designs to continually provide quality crafted products at an exceptional value.